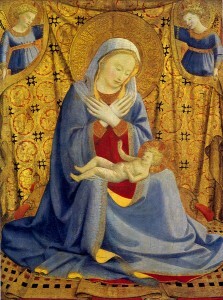 Today is the feast of the birth of Mary. Something I remember from my Catholic school days is something called The Imitation of Mary. It’s an actual book by Thomas A. Kempis, but the idea of imitating Mary is honestly intimidating. She was born without sin and she has so many miracles attributed to her. How the heck are we ordinary, flawed, imperfect humans supposed to be anything like her? 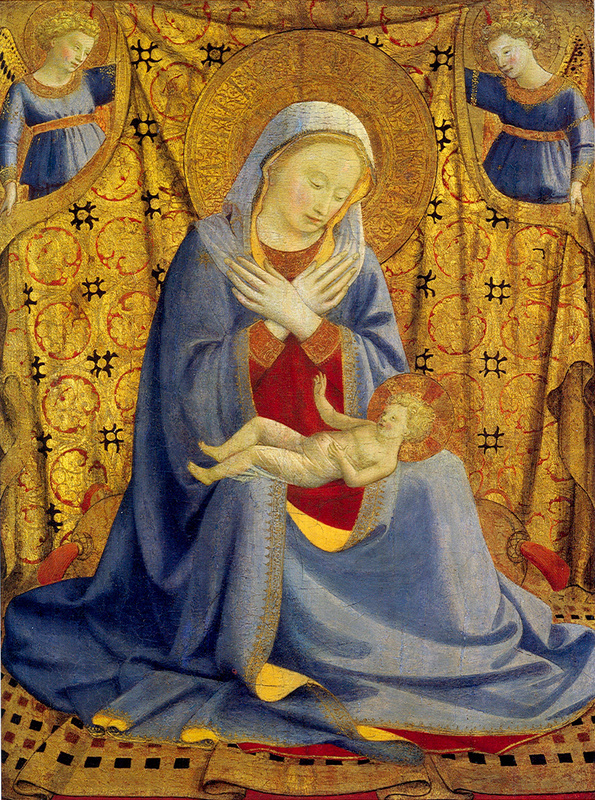 It starts by remembering that aside from being born without sin, Mary was just as human as the rest of us. She felt pain, she felt fear, she felt loss just like the rest of us. She was a mother and a wife and a daughter and a cousin. I imagine her as a short and sassy woman who wasn’t picture-perfect in looks, but still beautiful in heart. Once we remember that Mary (and the rest of the saints) are as human as the rest of us, it helps us on the path of relating to her and imitating her. The list seems daunting at first because we struggle with humility and patience. Not all of us see ourselves as sweet or wise or charitable. Being obedient is scary because we’re so used to asking questions about everything and being mortified is equally frightening because we are so used to doing what we want. But there are real-life examples of people practicing these virtues. They may not have all these virtues, but if we start with imitating one, it takes us that much closer to becoming like a saint. So let’s break down these virtues and see how people of the 21st century can live them. 1. Ardent Charity: Letting our love for God be the driving force behind every decision. We may not always make the best decisions for the right reasons. Everyone always seems to have an ulterior motive for their actions, some kind of personal gain. But when we put God first in our decision making, we can give our hearts into our actions freely, even when we don’t stand to gain anything from doing something. I can’t help but think of Saint John Paul II when I think of this virtue. He was a great example of someone who was driven by love. He lived his life with a great devotion to Jesus and Mary and he showed his love to the world, even to the communists who dictated his homeland and the assassin who shot him. All of his actions were motivated by unconditional love, acting with great justice and mercy. Communism fell thanks to his influence and a whole generation of people are inspired by his actions. 2. Profound Humility: Knowing who we are before God, nothing more and nothing less. Humility is a balancing act. On the one hand, we can’t be divas and think that we’re special snowflakes entitled to whatever we want just because we want it. On the other hand, we can’t go around acting like emo kids who think that we’re worthless wastes of space. Humility is knowing your own value and understanding that you don’t need anyone else’s approval or love outside of God’s. Another example is found in one of my favorite songs “He Knows My Name” by Francesca Battistelli. In a behind the scenes video, Francesca says that the song came from her struggles of believing what other people think of her, for better and for worse. The song itself tells the story of a person who sees herself as less than perfect, but at the same time, knows that God is calling her to live for Him and marvels in the love that God has for her. The music video shows four women who’ve all had hardships in life and overcame them through God’s help and have turned their lives around for the better. You wanna know why Police Lives Matter alongside Black Lives Matter and All Lives Matter? Because the true job of a cop, of a soldier, of anyone who works in public service is to be willing to lay down their lives for the ones that they love. The duty of all public servants is to protect and serve everyone, even to those who hate them. Deputy Sheriff Darren Goforth is being honored in Houston for the life that he lived. The fact that there hasn’t been any reports of violence in retaliation to his death says a lot about everyone else as well. Like public servants, the people who are honoring Darren Goforth’s death are laying down their desires to seek vengeance. Instead of rioting, the people are rallying, asking the world to “Love Thy Neighbor.” I wish other cities can learn from this. Something I recently learned is that we take the Holy Spirit with us wherever we go and in whatever we do. It’s not always easy because there are times that we wish God was far away or we don’t feel like he’s there when we need him. But like that infamous Footprints poem, God is there carrying us through the hard times. Stephen Colbert, who is going to start his stint at late night network comedy tonight, had an interview with GQ Magazine in which he talked about how God was constantly present in his life. He was grateful for the losses that he endured as a child, first by losing his father and brothers in a plane crash and then losing his mother later in life. “I was left alone a lot after Dad and the boys died…. And it was just me and Mom for a long time,” he said. “And by her example am I not bitter. Byher example. She was not. Broken, yes. Bitter, no.” Maybe, he said, she had to be that for him. He has said this before—that even in those days of unremitting grief, she drew on her faith that the only way to not be swallowed by sorrow, to in fact recognize that our sorrow is inseparable from our joy, is to always understand our suffering, ourselves, in the light of eternity. What is this in the light of eternity? Imagine being a parent so filled with your own pain, and yet still being able to pass that on to your son. 5. Blind Obedience: Following God’s call without counting the cost. There’s something about doing what someone says without asking questions that scares me. It calls to mind a hell that consists of shades of grey, military dictatorships, Big Brother. UGH! No thank you! The difference between that kind of obedience and following God’s will without counting the cost is that God does allow us to ask questions. In the Annunciation, Mary was initially confused at the angel’s greeting and asked “How can this be? I have known no man.” Gabriel gives Mary an explanation and proof of God’s power. After receiving that explanation, Mary accepts God’s will. If we were in Mary’s place, we’d probably ask more questions, to be honest, but God gives us enough knowledge to help us understand the present because the future is in His hands. One example of this is from the soon to be Bishop Robert Barron, whose ordination into bishophood takes place today. He posted a video explaining his coat of arms. One particular thing I love about his coat of arms is the motto he chose: Non nisi te Domine. The motto came from Thomas Aquinas who said this to God after presenting his works on the Eucharist in a private altar. Bishop-Elect Robert Barron said “If you have Christ, then you know what to do with the wealth, pleasure, power, and honor that come your way or you’ll know what to do with the lack of wealth, pleasure, power and honor which is why the one thing you should ask for is Christ himself.” As someone who’s also an Aquinas fangirl, I can’t help but totally agree with him. Follow me on the next page to learn about how we can practice wisdom, purity, sweetness, faith, and patience in our lives. Today, I learned a lesson in patience. I got an e-mail from my Sunday School Supervisors that there would be an Ash Wednesday prayer service just for the kids, so I decided to wait until 7:30 to get my ashes. The rest of the day proved to be a test of patience. My co-teacher and I were planning on getting pretzels and juice for the kids, but I wanted to be efficient, so I decided to buy the food about an hour before class started. In the end, I found that my patience was still tested. My first graders were restless and excited and the prayer service didn’t leave time for snacks and juice. Thankfully, my co-teacher and I decided that we would give the kids snacks after Spring Break. So like I told my friend: “Patience is a fruit of the Holy Spirit.” And boy did I learn a lesson in that today. In a way, Lent is a period where our patience is tested constantly. Sometimes it comes in the form of fasting. Sometimes, it comes when you aren’t sure if you can finish that extra prayer or give that spare change to the homeless person on the street. Last year, many Catholics learned patience during the Sede Vacante period between Benedict and Francis. But as last year taught us, there is always something better waiting for us when Lent is over. 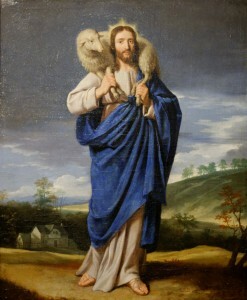 The Spanish mystic Saint John of the Cross said that in the evening of life we shall be judged according to our love. In Matthew 25 the nature of love is specified. It is not primarily a feeling, an attitude, or a conviction, but rather a concrete act on behalf of those in need–the hungry, the homeless, the lonely, the imprisoned, the forgotten. It is the bearing of another’s burden. Here’s a challenge: Over the next forty-seven days, resolve to perform a particular and sustained act of love. Make several visits to your relative in the nursing home. Converse regularly with a lonely person on your block. Tutor and befriend a kid who might be in danger of losing his way. Repair a broken friendship. Bring together bickering factions at your place of work. Make a number of financial contributions to a worthy organization that needs help. Numerous spiritual masters have witnessed to something odd: Belief in God is confirmed and strengthened not so much from intellectual effort as from moral action. 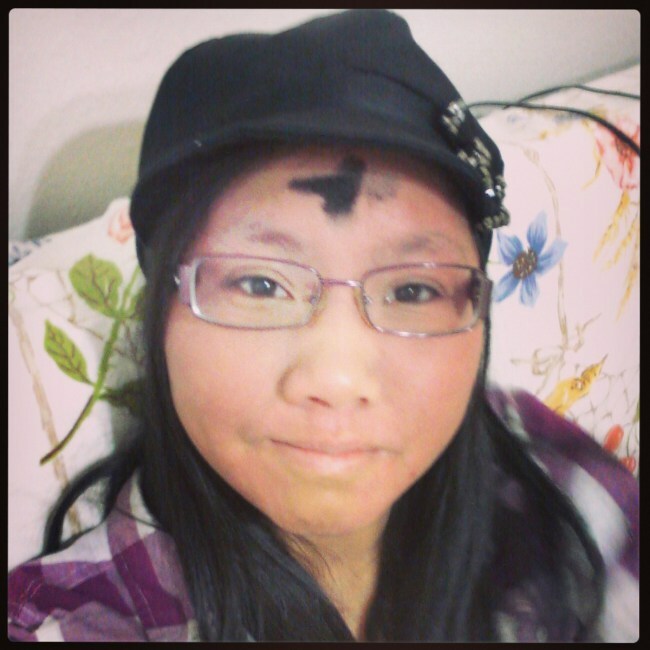 And finally, here’s my #ashtag selfie.